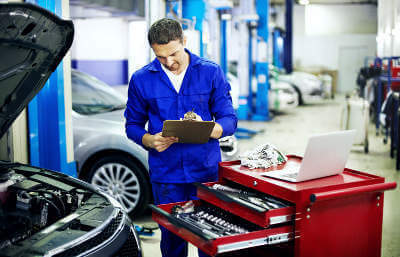 What Gets Tested in an MOT? • Mirrors – Security and condition of the mirrors are checked. Distortion or damage should not impair the driver’s view. • Doors – When the doors are closed, the latch must be secure. Doors must close and open from the interior and exterior of the vehicle. • Structure – No sharp edges are allowed. Specific area damage and excessive corrosion are not tolerated. • Exhaust – The vehicle type and age dictates the permissible emissions’ requirement. The exhaust system must silence effectively and have no serious leaks to be considered secure and complete. • Lights – Headlight aim is checked to ensure it is correct. The colour, security, operation, and condition of lights are assessed. • Washer, wipers, and windscreen – Wipers and washers must operate so that the driver has a clear view. The general condition of the windscreen is checked. • Horn – The horn sound must not be a multi-tone sequence. The sound and type of horn must be correct. • Vehicle identification number – The VIN of vehicles dating back to August 1980 must be legible and permanently displayed. It cannot be obscured, faded, or dirty. • Seats –Front seats must be secure and firm. All seats must be securely in an upright position. • Seatbelts – Compulsory front and rear belts must be in place. The belts are checked forsecurity, operation, condition, and style. • Suspension and steering – These items must operate correctly and be in good condition. • Fuel system – There cannot be any leaks. The cap must seal and fasten securely.Fuel caps must open with a key or be released from the interior of the car. • Tyres and wheels – Tyres with serious bulges, cuts, or other damage will not pass inspection.The tread depth, tyre size/type, security, and condition are checked. • Brakes – An efficiency test checks performance, operation, and condition of the brakes. • Registration plates – Digits on the plate must be correctly formed and spaced. The plate mustbe legible and secure. A “blue triangle” logo is displayed at all vehicle inspectorates. The DirectGov website can be used to check the authenticity of an MOT certification. You will need the MOT test number and vehicle registration mark. We hope this article has helped provide some useful insight, if you have any questions simply tweet us @MyCarNeedsA_ using the hashtag #MCNAQuestions.